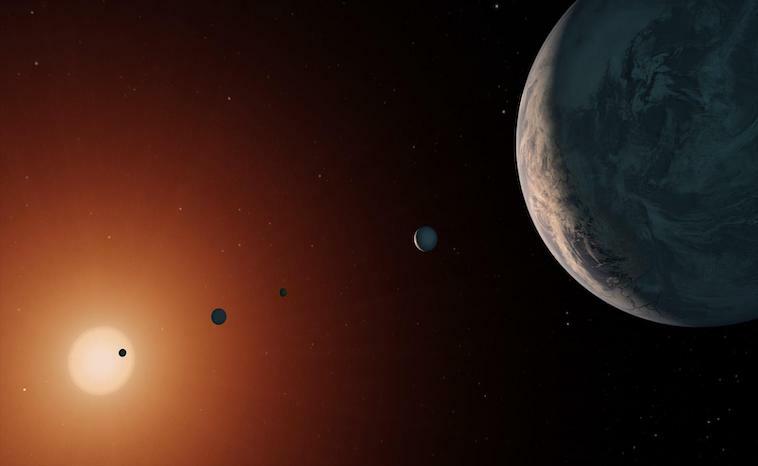 Discovered in 1999, the Trappist-1 star amazed astronomers when in 2017, they found seven planets orbiting the star. Since then scientists have spent time working on learning more about the planets. They believe that one of the planets may have elements and conditions similar to Earth. A new paper written in The Astronomical Journal from November 9, 2018, suggests that some the planets may have atmospheres. Sarah Morgan, the lead researcher at John Hopkins University, used the Hubble Space Telescope to look at the planets. The telescope showed that the innermost five planets do not have clear hydrogen atmospheres. The team used absorption spectroscopy and electromagnetic radiation to measure the planets. Furthermore, absorption spectroscopy works when trying to find interstellar clouds and if they contain molecules. In addition, the spectrum can also determine a planet’s atmospheric composition, temperature, pressure, and a planet’s mass. Morgan’s team focused in on Trappist-1 d,e,f, and g. They compared their new computer models with the spectral data from Hubble. The results showed that d,e, and f probably have hazy or cloudy atmospheres. These atmospheres continued to change as the planet formed. How did they reach this outcome? The team used recent laboratory astrophysics experiments that studied haze formation. This haze formation set a range within planetary temperatures and atmospheric compositions. Trappist-1 g may have an atmosphere that formed when the planet formed. Since its formation, it has not changed very much. With regards to Trappist-1 f, they are not sure if this planet is similar to planet g.
What exactly is haze? Haze typically refers to dust, smoke, and other dry particulates that prevents a clear sky. A wildfire that has burned for days will create a haze in the atmosphere. The paper suggests that several of the planets have a primary atmosphere. A primary atmosphere forms from the gaseous matter from a nearby sun. These tend to be very thick in composition. The report also states that the atmospheres are not made up of hydrogen and helium. With a clearer picture of the atmospheres, scientists can start determining whether these planets are habitable. Right now scientists believe that Trappist-1 e has an atmosphere with high-altitude clouds. Furthermore, the planet may have an iron core making it very similar to Earth. Determining more information about the Trappist-1 system may take some time. We do not have the current technology to reach a system that is 39 light years away. A deep space probe would take hundreds of thousands of years to get near the planets. The question remains what will happen if they do determine whether Trappist-1 e can support human life. Unless technology changes we may never reach the Trappist-1 system. However, each day out knowledge increases and we hope that we may visit Trappist-1.